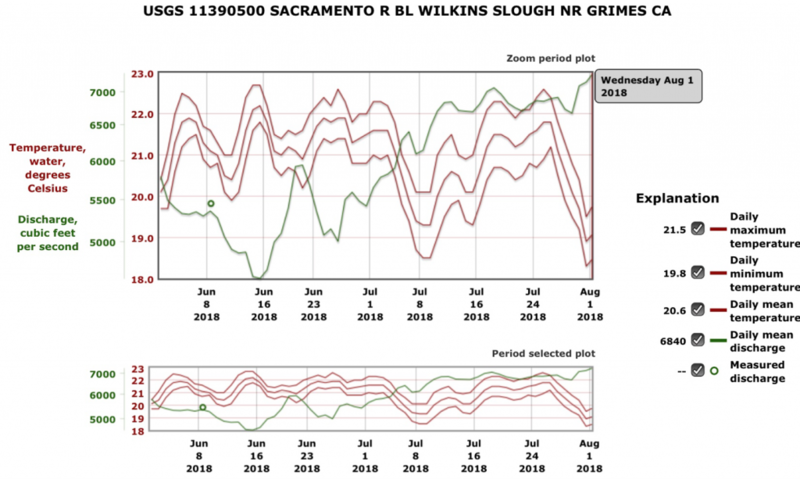 Reports on the July 15 opener on the lower Sacramento fall-run salmon season are good.1 Reclamation and Sacramento River farmers have provided the flows needed to keep water temperatures down (Figure 1), allowing what appears to be a good run up the river from the Golden Gate. Openers in recent years have been poor because of low flows and high water temperatures, as well as low salmon numbers. Numbers are up, and water temperatures are down – good for fishing. Figure 1. Higher flows in July have cooled the river despite many 100+ degree days. Source. 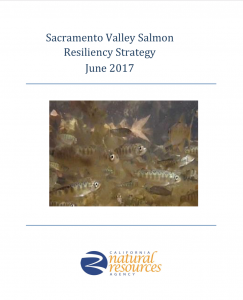 The Sacramento Valley Salmon Resiliency Strategy, June 2017, is the state’s strategy to improve the resilience of listed salmon to its activities, including water rights permits, State Water Project actions, CESA implementation, and CDFW management. Increase productivity by improving spawning and incubation conditions (habitat and water quality). Increase productivity by increasing juvenile salmonid survival. Support the full range of juvenile migration conditions to maintain life history diversity. Support the full range of adult migration conditions to maintain life history diversity. Maintain genetic integrity by limiting genetic influence from hatchery-produced fish and interbreeding of genetically or behaviorally distinct runs. The Strategy is defined as a “resiliency” strategy and not a recovery strategy for a reason. It does not include the actions necessary for recovery. It won’t fix the activities that caused the crisis in the first place. Over the past several decades, much restoration has occurred, yet fish populations continue to decline. Much stronger and more immediate management actions are needed to save the salmon populations. Habitat restoration alone will simply not suffice. Spawning and incubation conditions – Missing are actions to maintain cold water temperatures and sufficient spawning flows in the reaches below all the major dams during spawning and incubation. A. Eliminate the water temperature increases caused when water from Whiskeytown Reservoir is routed through Spring Creek Powerhouse to Keswick Reservoir. B. Maintain cold water in the Sacramento River downstream to Red Bluff, not just to Redding. C. Eliminate dewatering of winter, spring, and fall–run salmon redds in the Sacramento River. D. For the American and Feather rivers, take actions similar to A through C that maintain cold water and eliminate redd stranding. E. Better manage reservoirs to place more emphasis on cold water pools and less on water deliveries. Juvenile salmon survival – Maintain adequate flows and water temperatures in rearing reaches to sustain growth and to reduce stress and predation. Full range of juvenile migration conditions – Maintain adequate flows and water temperatures in the lower rivers and the Delta throughout emigration seasons. Do not shave off early and late seasons. Adult migrations – Maintain adequate flows and water temperatures to assure adult survival, egg survival and gonad development during migration. Do not shave off early and late seasons. 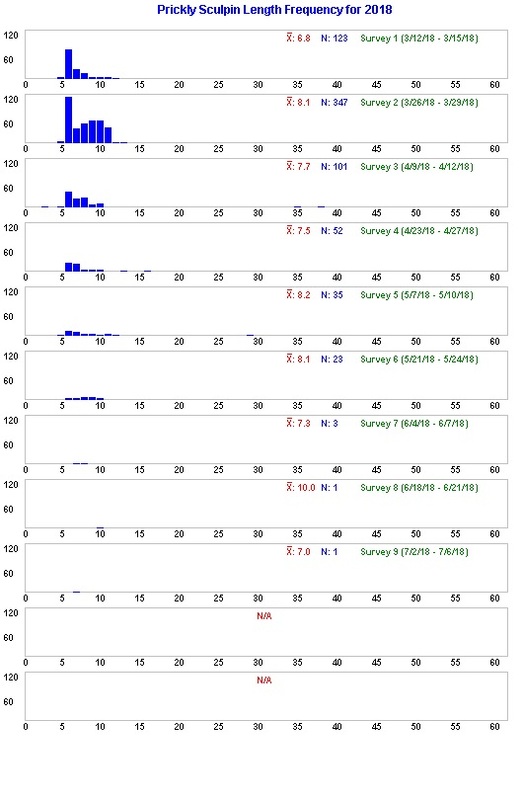 Genetic integrity – Move more toward conservation hatchery activities, reduce straying by barging smolts, implement natural floodplain rearing, mark all hatchery smolts, and introduce mark-selective recreational fisheries. As for other planned actions like completing projects on Battle Creek and reintroducing salmon upstream of Central Valley rim reservoirs, let’s get on with it. If we keep the present snail’s pace, there is little hope for future salmon generations.